Week 39 This week we paint the hull and start the deck houses. The first part of the instructions deals with painting the hull. See below. First off, there may be an error in part S11. The dotted line should be in the centre of the bit. Mine was offset slightly. Not a problem, just check it and re-draw it if necessary. The other bits are all OK.
Next off is to draw a centre line on the deck. Put S11 in place first, holding it with masking tape. Then mark the centre of the deck at the aft end. Take a nice long straight edge (I used a left over piece of laminate flooring. Be careful if you are using wood - lengths of wood are not often perfectly straight.) and mark a pencil mark from S11 to a spot about 10cm short of the end of the deck. The parts were all fitted as per the instructions. No great problems, although it was a bit fiddly at time. It was all glued together with white glue, with one exception. Forward and aft bulkhead 83 & 86 were glued in place first, then the side pieces 84 & 85 were held in place and super glue run on the inside edge. Capillary action takes the glue underneath. This method allowed the pieced to be put in position first and the glue applied later. The little cabin that was made in issue 17 was fitted as well. I really have no idea why they left this until now to fit. 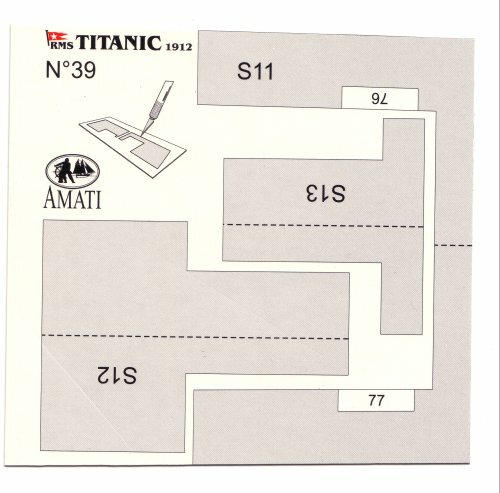 With the card template S11 in place, now is a good time to finish the edges of the deck to an accurate size. The edges of the card are where the edges of the deck should be. If you turn the model over, so you're working from the bottom, The overhang of the deck should be even down the length of the model and the same both sides. However, make sure that the edges of the deck are straight and even. If your bulkheads just below the deck are a bit wobbly, you don't want to introduce this error into the deck edge. I've started painting the model. After a fairly unsuccessful attempt to find out what colour the original ship was, I gave up, went down to Halfords and browsed the touch-up sprays till I found something that looked right. I eventually decided on Fiat Red Orange. It may be a bit bright, but I'm happy with the choice. The hull got a rub down with very fine wet'n'dry, used dry, then I masked the deck and white bits of the hull. The hull then received a light coat of primer to show up any defects. There were a few. I fixed some, but some were so small it wasn't worth the effort. I want to finish painting the hull this year !!!! After that, the hull got its main coat of primer. I used red primer as recommended for the Fiat Red Orange. This got a light rubbing down with fine wet'n'dry (about 1000 grit), then got sprayed with the gloss red. I gave it a light coat which dried for 24 hrs, then rubbed that down with 1200 grit wet'n'dry used wet. Finally it got another couple of coats following the instructions on the can. Note that you will need to spray both from the top and bottom or you will miss the top edge of the second layer of planks. 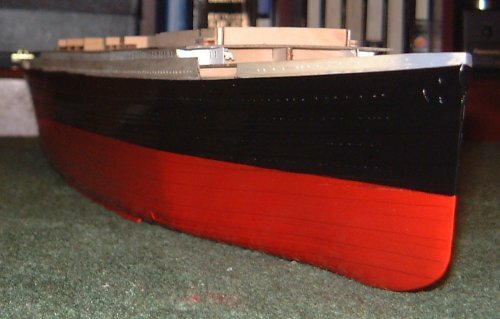 I haven't marked the waterline on the hull yet, but have just sprayed the red so that it fades out before the masking tape at the top. This will be given a week to dry before I start masking the water line to spray the black. It took rather longer than a week before I managed to get some weather good enough to spray in. However, I got there eventually. The water line was marked with a pencil taped to a block of wood the right size so that the height of the pencil point was 50mm. Then I used masking tape to cover the bottom of the hull completely, and finally sprayed the black. The photos above show the end results after all the masking tape had been removed. It really is a very satisfying moment removing the tape and watching a rather scruffy black and red object transform into a beautifully finished hull. If you've got this far you have finished the really difficult parts of the model. The rest should be a lot more straight forward. A few tips about spraying. Don't spray when the weather is damp, raining or misty. The humidity in the air can make the paint bloom. Wipe the model with a dry cloth before painting to remove any dust. Keep the can moving while you're spraying. It's best to start moving the can, then press the nozzle. When you finish the run keep the can moving while you release the nozzle. Don't put the paint on too thickly and don't get too close to the model. Don't put the paint on too thinly or you won't get a good smooth finish. Read the instructions on the can - they were written by somebody who knows what he's talking about. It can be quite easy to get the parts in the wrong place or the wrong way round when constructing the deck houses. Take your time and compare all the parts against the photos.